hyundai has launched an updated version of the i10 it released recently.IT is powered by a 1.2 litre kappa engine,at its plant in chennai. Hyundai Motor India Ltd on Tuesday rolled out the i10 powered by the all new 1.2-litre Kappa engine at its plant in Chennai. The in-line, four-cylinder, 1.2 litre engine while adding to the power will also deliver greater operational efficiency in terms of both fuel consumption and emissions. Company said that their new Kappa engine is the best in class today, with more power, less fuel consumption and a lower CO2 and overall emissions. The engine is aluminium block, Double Overhead Cam Shaft (DOHC), 16 valve with 32 bit microprocessor Kappa engine delivers now even more power as compared to earlier engine of i10 that is, 80PS/5200rpm and 11.4Kgm/4000rpm torque. The engine is Euro 5 ready and emits only 119g/km of CO2 which is the lowest for this class of cars. 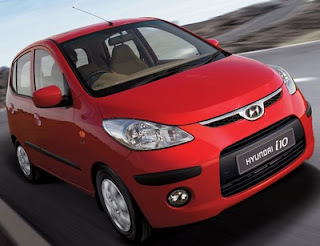 It is also said that engine is 4% more fuel efficient than current 1.1 i10. The new Kappa i10 is priced between Rs 3.99-5.43 lakhs. New i10 Kappa will also come in an automatic transmission variant with 4 speed automatic gearbox. The Kappa i10 will be launched in three variants the Magna, Sportz and the Asta with all top-end features like the sunroof, 2-Din audio system, a unique red pack for the Sportz interiors and some class leading safety features like anti-lock braking system (ABS) and dual airbags.